Ft. Myers Beach will play host to thousands of tarpon, this is when Go Fish Charters and Guide Service begins targeting tarpon on a daily basis. These tarpon will establish a pattern of movement from area to area. To insure our fishing charters are productive we start targeting tarpon as soon as they show. Setting up in various locations and chumming and live baiting the area. These tarpon charters in the early part of the season are spinning rod and sight casting trips and can be mixed up with a flats and backcountry trip for snook red fish and other species. As May approaches and the water temps get optimal these giant tarpon move North into Boca Grande Pass. This is where all the fast paced action takes place as veteran tarpon guides and anglers converge on the pass for the next two months. This tarpon fishing fleet will operate 24 hours a day in a truly phenomenal display of what is locally known as the Boca Grande Dance. Go Fish Charters and Guide service and Capt Andy Boyette will shift in to high gear and fish from daylight till dark. With the long days it affords a two fishing charter a day schedule. Each charter is 6 hours long with a morning tarpon fishing charter beginning at 6am and lasting till noon. This charter consist mostly of jig fishing in the pass. After a lunch break Capt Andy will pickup another fishing charter party for the afternoon 1pm-7pm returning to Boca Grande Pass for a time, to jig fish, but as this trip progresses the tarpon will start to break up into smaller groups and move slightly off shore to the Beach, the rest of the trip will be sight casting and free lining live bait. Both the morning and the afternoon fishing charters are equally productive. Go Fish Charters and Guide Service and Capt. Andy Boyette have the experience to produce consistently on either of these tarpon fishing charters. So if you want to fish early and spend the afternoon on a Fort Myers golf course, sightseeing on Ft Myers Beach Florida's beautiful coast or want to check out the local night time scene in downtown Fort Myers; and sleep-in and catch the afternoon fishing charter we can accommodate you. 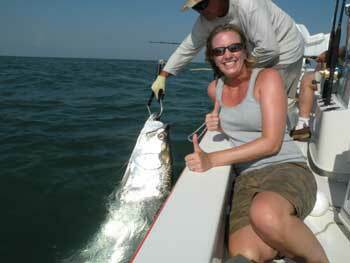 Tarpon Fishing Charters are available for up to four anglers or group arrangements can be made. Tarpon Fishing Fort Myers, Ft. Myers Beach, Boca Grande Pass, Charlotte Harbor, and along the beaches, live bait, jig fishing, or fly fishing. Planning a trip for a Fort Myers tarpon fishing charter! I do two tarpon fishing trips daily May-July. These months are highly sought after, and tarpon trips book up early. Tarpon fishing has gained in popularity over the past several years, as anglers see tarpon fishing shows on TV like the Professional Tarpon Tournament Series, PTTS, and Tarpon Of Boca Grande. With such national coverage of the Boca Grande tarpon fishing phenomenon more anglers are planning their entire Florida fishing trips around Boca Grande tarpon season. I offer two 6-hour Tarpon fishing charters per day, one in the morning and one in the early afternoon. I fish the entire tarpon season every day, every year, along side some of the best guides in the business, guides like my self that can produce consistently and put their clients on tarpon day in and day out. So before you make a decision on a tarpon guide do some homework. I want to make sure you catch the tarpon of a lifetime whether or not its with me. If you looking for a great tarpon fishing adventure there is no place like Southwest Florida. The opportunities are plentiful and diverse. I am fishing Fort Myers, Boca Grande, and Charlotte Harbor for Big Tarpon this is the best fishing Florida has to offer. I do two Tarpon Fishing trips daily May-July. 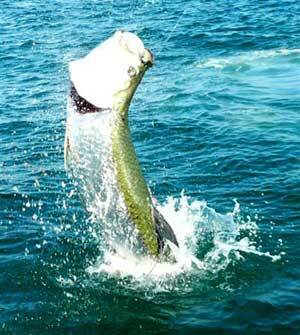 These Tarpon Fishing Months are highly sought after and are prime fishing months. Booking early will guarantee you get the date that best fits your schedule and insures your tarpon fishing charter will be secured. 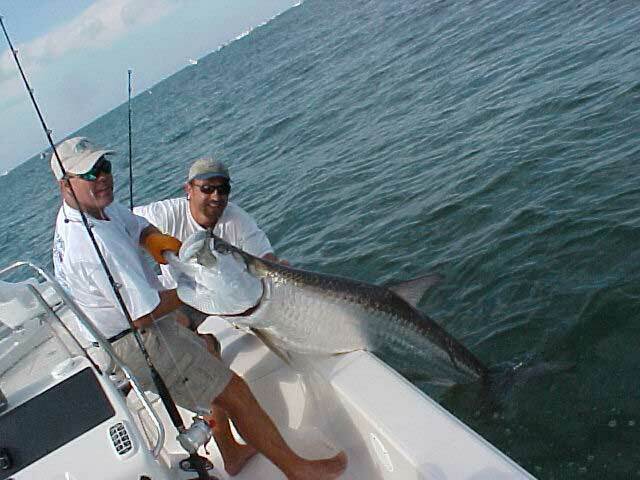 Tarpon fishing charters range from beach fishing, Boca Grande Pass fishing as well as fishing in Charlotte Harbor and Pine island sound with a wide range of proven fishing techniques. Go Fish Charters and Guide Service has been guiding clients to trophy tarpon, snook, and red fish in Southwest Florida waters for over 10 years.